Contemporary Artists of Pretoria, the first of its kind published in South Africa, features 35 Pretoria based artist. They are listes alphabetically and two full pages are devoted to each artist. Rather than voicing his own opinion, the author has allowed the artists to complement their biographical descriptions with their own comments about their approach to and style of art. The trials and tribulations related by the artists makes fascinating reading. A full colour portrait of each artist complements the description and the facing page displays a piece of work, again in full colour, of the artist. Contemporary Artists of Pretoria is bound in a strikingly bold laminated cover made up of diamonds shapes representinbg the green and purple of the jacaranda colours and the colours of the city of Pretoria, namely red and yellow. Contemporary Artists of Pretoria is a practical book of lasting value. Its size makes it easy to handle, and the text is aimed at the lover of art rather than the academic. There is a general index and a contact list which includes the telephone numbers of the artist. 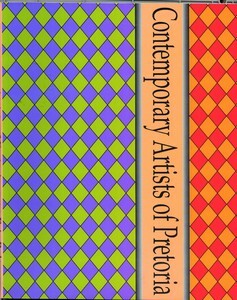 Contemporary Artists of Pretoria was published by Be My Guest Publishers in?Pretoria as a 79-page soft-cover edition in 1993.